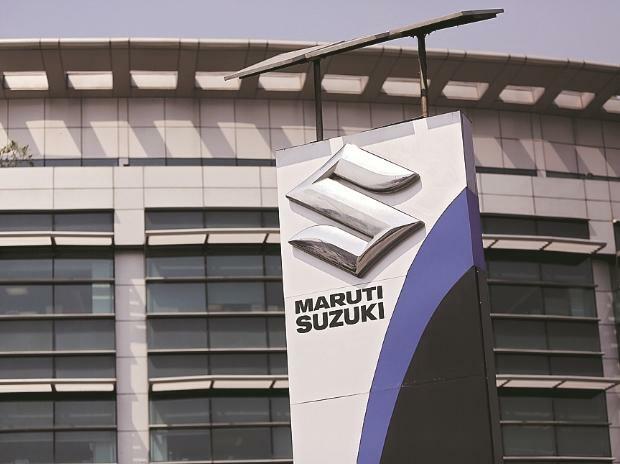 Car market leader Maruti Suzuki India is creating a dedicated business model in a bid to tap into the institutional customers better, said people aware of company's plans. As part of the plan, the local arm of the Japanese car maker plans to set up a separate sales channel and provide a complete end-to-end solution ranging from sales and service to insurance and finance, said one of the persons. The company is expected to formally launch the channel later this financial year. Expected to be the next big strategic step after the Nexa and True Value, the move is prompted by the disruption in the car usage pattern caused by the app-based ride-hailing companies such Ola and Uber, said person aware of the plans. Presently, Maruti caters to institutional buyers through a dedicated team under a separate vertical that offers special packages to such buyers. “The new channel will help the company address them better,” said one of the persons cited above. “There is a plan under consideration,” confirmed Kenichi Ayukawa managing director and chief executive at Maruti Suzuki India, pointing out that the company has been studying the disruptive trends in the market closely. “It can’t be just about volumes, we have to look at the whole business model,” said Ayukawa, refusing to be drawn into details. 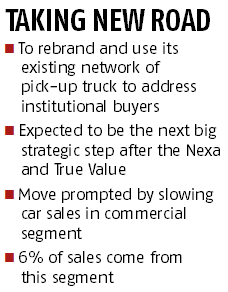 To begin with, Maruti may re-brand and use its existing network of a pick-up truck, Super Carry, to cater to the institutional buyers. It currently has a network of 190 outlets across 159 cities. The additional volume from passenger vehicles for commercial sales will make these dealers more viable, said the person aware of the plans. App-based ride-hailing taxi market that till recently had been expanding at a brisk pace, has disrupted the car usage pattern shifting the focus from individual ownership to shared economy. Automakers see it both as an opportunity as well as a threat. I.H.S Markit, a sales forecasting and market research firm, estimates the segment which currently accounts for 100,000 units of passenger vehicles sales every year, to increase to 800,000 units per annum by 2030. But Maruti’s plans will go beyond the realm of merely selling cars to Ola and Uber or any other such firms. It is eyeing the entire value chain related to the cab aggregator market and looking to differentiate itself from the rivals by addressing the complete gamut of services which besides insurance, finance, spares and after sales, will also give the buyers an option to lease cars, said the person cited above. The leasing facility would be a relief to individual driver/owner of cars who has lately been struggling to pay installments owing to an increase in commission charged by the aggregator firms. Maruti’s sales to the commercial segment, which includes sales to fleet operators, taxi aggregators and goods carrier segment in which it sells the Super Carry pick-up truck, accounted for 6 per cent of company’s 1.6 million units sold in the domestic market in financial year 2018, said Maruti’s spokesperson. Of this, the Super Carry accounted for 10,003 units. Excluding the pick-up, company’s sales in the commercial segment dipped over a year ago, the spokesperson added without specifying the drop. “Even as the sales to individual customers across the country, including the 20 cities have been strong, institutional sales have weakened lately,” said one of the persons cited above. This added heft to the rationale for setting up a dedicated channel for such customers, he said. Even as the app-based ride-hailing market continues to expand in India on back of new product offerings by the companies and an under-served public transport system, the pace of growth has tapered off to 5 to 7 per cent month-on-month since mid-2017 from the high 30 per cent in 2016, said Jaspal Singh, partner at Valoriser Consultants, a New Delhi-based research and advisory firm. Singh attributes the slower growth to the aggregators reaching the saturation point in the top 10 cities. A reduction in incentives and an increase in the commission for the drivers, has also slowed the pace of expansion, he added. Singh expects the next phase of growth to come from smaller towns and cities.